Always know your glucose number and where it’s heading with the Dexcom G6™ Continuous Glucose Monitoring (CGM) System – FDA-cleared for diabetes treatment decisions with zero fingersticks and no calibration. * *Fingersticks required for diabetes management decisions if symptoms do not match readings. Only use this app if you have the Dexcom G6 CGM System. With Dexcom G6, always know your glucose number with just a quick glance at your compatible smartphone or smartwatch. For a list of compatible devices visit www.dexcom.com/compatibility. Dexcom G6 provides real-time glucose readings for patients with type 1 or type 2 diabetes every five minutes. Dexcom G6 is FDA-cleared for children age 2 and older. The Dexcom G6 System provides personalized trend alerts right on your smart device and lets you see when your glucose levels are going too low, or too high, so you can better manage your diabetes. The Alert Schedule feature lets you schedule and customize a second set of alerts. For example, you can set the schedule to match your work hours and have different alert settings during the rest of the day. 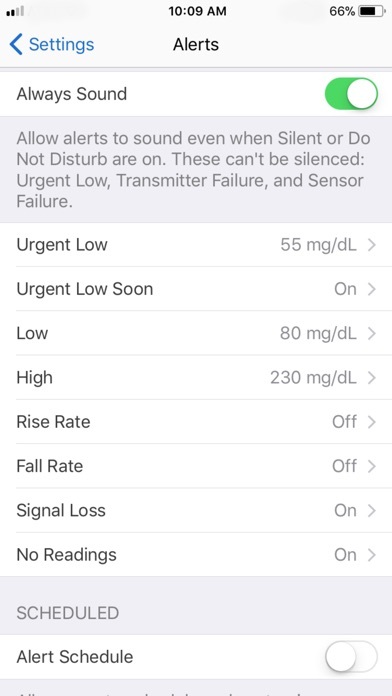 Custom alert sounds are available, including a Vibrate-Only option on the phone for glucose alerts other than the Urgent Low Alarm. The Always Sound setting allows you to receive certain Dexcom CGM Alerts even if your phone sound is off, set to vibrate, or in Do Not Disturb mode. This will allow you to silence calls or texts but still receive audible CGM Alerts, including Low and High Glucose alert, Urgent Low Soon Alert, Urgent Low Alarm, and Rise and Fall Rate alerts. Please note that when your phone is set to Silent or Do Not Disturb, you will not receive any audible alerts for Signal Loss. Always Sound is on by default. A Home screen icon shows you if your Alerts will sound or not. For safety, three alerts cannot be silenced: Urgent Low Alarm, Transmitter Failure, and Sensor Failure. In addition to the accurate performance provided by the Dexcom Sensor, you’ll receive other valuable features: • Share your glucose data with up to ten followers in real time. Followers can monitor your glucose data and trends in real time on their compatible smart device with the Dexcom Follow app. Share and Follow functions require an internet connection. 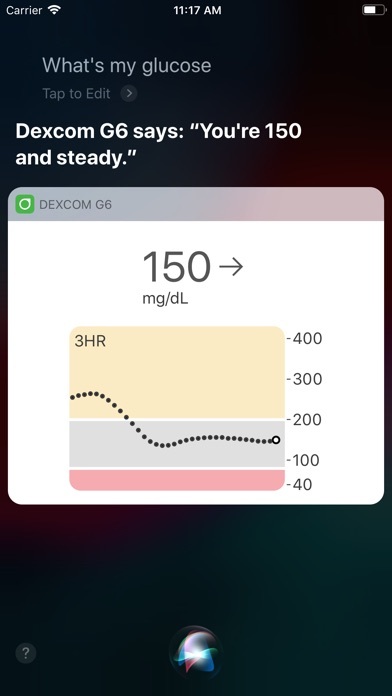 • Health app access so you can share retrospective glucose data with third party apps • Today View widget, which allows you to view your glucose data on the lock screen of your smart device • Add a shortcut to Siri to run by asking Siri to read your current glucose value, using a custom phrase. 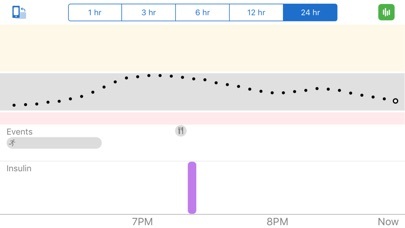 • A Dexcom CLARITY link on the landscape trend graph lets you easily transition to the CLARITY App to view more information on your glucose trends Apple Watch View your glucose information, trend graph, and alerts and alarms right from your wrist with the Dexcom G6 Apple Watch app. Watches require compatible smart device to use app. • Use the digital crown to scroll through 1, 3, or 6 hours of glucose trend data • Dexcom G6 watch face complications allow you to view your glucose number and arrow from your watch face • Add the Dexcom G6 app to the Dock and enable background refresh for best performance Customer Reviews This app store should not be used as your first point of contact to resolve technical or customer services issues. In order to protect your privacy and personal information, and promptly resolve any technical or customer services issues you are having with any Dexcom product, please contact 1-888-738-3646. 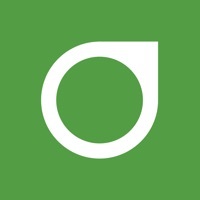 Dexcom is required to follow up with customers regarding product-related complaints. If Dexcom determines that your comment/complaint requires follow up, a technical support representative will attempt to contact you to gather more information regarding your comment/complaint. App has some bugs, but 5 star review because this is the best CGM on the market hands down!!! I can always rely on Dexcom they are always willing to help when a problem comes up. Thank you for giving me the technology to always know where my Blood sugar is at. We need the 6, 12 and 24 hour graph back on the home screen and bright colors! The new app is a setback. Hi, I have your Dexcom g6 and the sensor just stops for no reason sometimes. If you can find out why that would be greatly appreciated, Thank you. Trying to figure out a if I can go back to the last iteration of the app? This update is is HORRIBLE!!! Can’t see the hour graph without turning the phone—why? It was great as it was before. I turn my screen lock on, but every time I want to see beyond 3 hours I have to turn it off? Why?? SO OBNOXIOUS!! This update is the WORST!!! WHY???!! The colors are terrible, it’s so unfriendly to users, why do this? I’m a parent who checks a child several times a day and have cried over my stupidity updating to this version... Why is this better? I don’t understand? UPDATE: This “Priority Support Portal” that Dexcom is including in its replies to these reviews (see developer response below) is a dead link. There appears to be no such priority support portal. It’s a smokescreen to make these bad reviews look better and I’m insulted. 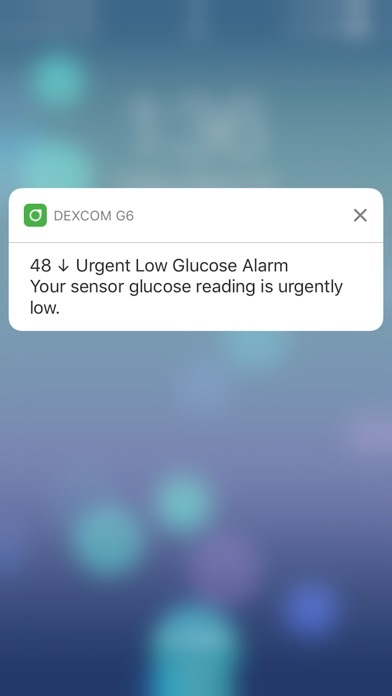 That’s a bad look, Dexcom. My review: First, this tech is amazing and is literally giving me 50x more data than fingerpricking and strips. Love it. No more super bad late night lows. Definitely lowered my A1C. There are a lot of complaints in these reviews, including mine, but you should STILL get one of these things if you’re considering it. Your diabetes management will be better and easier. Dexcom: GIVE US MORE CONTROL OVER SOUNDS. If I’m at work, in class, or at a movie, the only thing keeping this thing from screaming at the top of its lungs is if I close the app. But then I can’t see the app to peak at my blood sugars. At work I ended up cutting the wire on a pair of old headphones and plugging it into my headphone jack to silence the stupid thing. It’s right there in front of me, I can see it, I don’t need max volume alarms going off. I should not have to hack your app when your developers could easily build in more articulate volume and notifications controls. This is not a technical limitation problem, it’s a design problem. The ridiculous baby crying gag is infuriating and just irritates people around me. I’m already aware of the issue, I’m checking the darn thing every 60 seconds. Cool it with the super loud baby. And you should prepare yourselves for the amount of lawsuits you’re going to get when people start getting hearing loss from the volume of these alerts in the earbuds. It’s real bad. Give us more audio controls. 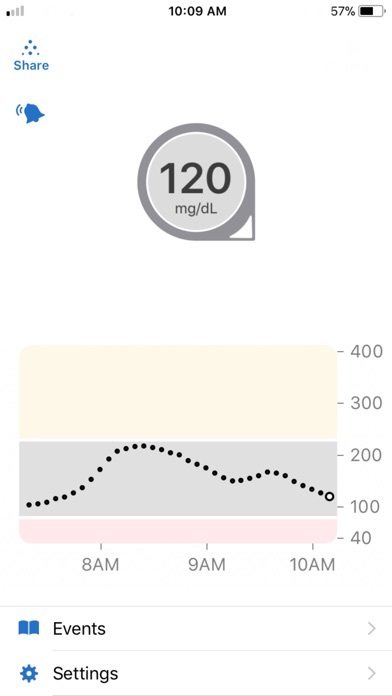 Dexcom: The amount of screen space given to the graph is silly. Make it bigger. It’s like the most important thing on that screen. Don’t keep it in a tiny sliver. Dexcom: This fake customer support portal is shameful. 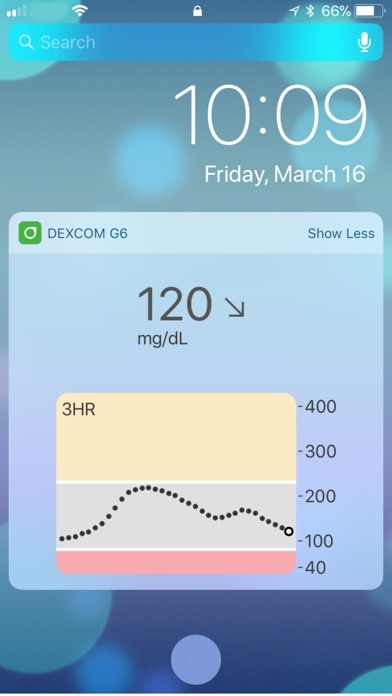 Been using the Dexcom G6 since December with an iPhone 8. More often than not, I don’t see data on my phone, but at least I was seeing it on my receiver. More recently, however, I have been averaging 10% for days with CGM data. So now neither the phone or receiver are working. I have contact support at least 5 times. Changed sensors, changed transmitters, haven’t updated software on phone and don’t swipe the app off of my home screen anymore. I was told all of these things would help. They haven’t. My only option now is to go back to finger pricks. This was certainly an expensive “test” for me. After setting nighttime alerts, the app crashes every time I go back to the alerts section of the app. I need to change some things, and I haven’t been able to. I love dexcom and everything about it. I couldn’t live without this technology. This bug needs to be fixed though. The G5 app really wasn't bad, but the G6 app? Horrible! I have been using Spike for months now and am only forced to us the G6 app because Spike isn't working. But come on, some kind of predictive plots please! Many apps do it, why not Dexcom? Your devices work beautifully, but with each new update the digital experience worsens. Things to fix? Different color options. You know, so I'm not blinded by it at 3am. Predictive glucose plots. This is the biggest thing people just don't do well in their heads, but computers do beautifully, especially with all the juicy cgm data we're serving them;-) It is life changing being able to use that. Better, more truly customizable and snoozable alerts. Let us stop hating your app! You make arguably the best cgm technology, and that's great. But you're dropping the ball on the user experience, both is actual quality of care, and quality of life. Hire a new app development team, or better yet outsource it to a company that is really good. We all know you can afford it, you're raking in the cash. So give us a little something and you'll continue to be top of the heap. Or just let this app become completely useless?! And don’t just say you’re going to pass this message along! Totally dissatisfied! It simply gets worse with every update! Now, the app constantly force closes, making it barely even usable! I’m sorry to say it, but this is one pathetic showing by Dexcom!! Prior comments: Since the latest update, I’ve been losing my connection constantly. It was a problem before, but now it’s much worse! I have to force close and restart the app virtually every time I go to look at my levels. On top of that, the Apple Watch complication is now made virtually useless. Please fix ASAP!! Also, please modify so that we can enter insulin dosages to the hundredths (like the G5 app did) - that way, it will match the actual amount of insulin I’m getting from my pump!! What Happened to the longer glucose view? 24 hours was awesome. So disappointed! How’s is this an upgrade? Less information is never an improvement. Pls change it back. The old app was better. I’ve been using dex since G4. The G6 is amazing. Wish I could wear for 14 days vs 10 so I could build the rhythm of sensor changes into my week more naturally. But accuracy is amazing even with no calibrations. The app has come a long way but still has room to grow. I would like the ability to acknowledge an alarm or calibrate (if needed) from my watch. I dismiss alarms on the watch, only to be notified again. I feel that forcing use of the phone to actually clear the alert is unnecessary. With the update on the Follow app, we have to turn on screen rotation instead of just tapping on the graph to get info beyond 3 hours. Can you make this available again? 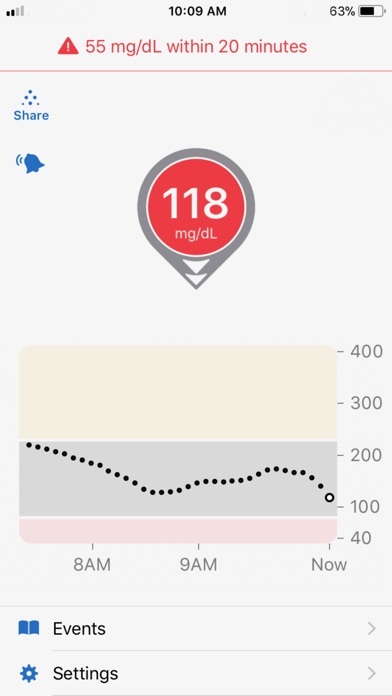 Dexcom has been a lifesaver for our family; however, we have struggled with alerts consistently sounding on our phones (parents of t1d son) through the follow app. It has been hit or miss if they sound on our phones. Luckily, they always sound on his phone, but it is frustrating at night if they do not alarm on our phones. Our 9 year old son Wears the G6 and we used to be able to follow his numbers on the Dexcom follow app. I just tried to download it in my new phone and it is no longer available via the App Store. Why???? Isn’t that the benefit of dex? So frustrating. I’m liking the Dexcom g6 it’s definitely helping but I do have some complaints. I’ve noticed that my Dexcom can be 30-40 off from my actual number which I feel is kinda dangerous. I have to calibrate multiple times a day. Also the sensor adhesive does not last long at all. I know that we can buy additional adhesive products but i feel like the actual sensor should stick for more than 2 days. I was hoping that maybe in the future Dexcom will make a sensory that I can wear on my arm instead of my stomach. Kinda feel bad for all the complaints but truthfully the Dexcom is helping me better control my sugars. We are brand new users of the Dexcom G6 cgm. Our 2 year old daughter is the user of the device. The CGM is a wonderful idea. It last 10 days and at minimum saved us from having to administer 50 fingepricks. It allows you to see real time how different foods effect the blood glucose. It also immediately tells you when the person drops low or goes high. Those are the positives to the device. The negatives are really in the software and app. We lose the signal at least 10 times/day. The Dexcom follow app/ the one for family members is even worse and I will be doing a separate review for it. It cost a lot of money for the Dexcom and diabetes is a very stressful disease. It is even more stressful when the app is t working or the receiver that comes with the device looses signal. Also the interface is very bland and Dexcom should give more option to personalize the app and store the data. Please please get rid of the gray background inside the logo Dexcom! Since cataract surgery I cannot see my glucose level at night. This simple change would help low-Vision users tremendously. Thank you for adding the Siri shortcut though. I don’t want to wake up my husband talking to my phone at night. I can see IOB in the InPen app and glucose number in Nightscout and Nightguard. After last update a few days ago, can’t see any more blood sugar history than 2 hours. Used to be able to see up to 24 hours. I really like Dexcom as a company, but poor app for followers, and now it’s getting worse every update. A very user friendly app. Suggestions: I have two phones and I would like to pair both phones with the transmitter in case I have one phone on me and not the other. Hope that there is a solution to this. Please get rid of the “Notifications are turned off” red banner on the app’s screen. I know the notifications are off. I turned them off intentionally. I would like to dismiss that banner. The update is terrible. You can’t switch between 3, 6, 12, and 24 hour view. This wasn’t a problem until about a week ago. Now, when I don’t open the app after the first alert, the second is SIGNIFICANTLY LOUDER! I don’t understand why the volume settings have changed and why what I have it set for isn’t the standard the app runs by! I thought this issue had been fixed - why has this issue returned!?! Otherwise, the app works great - though I second other reviews that complain about the different data seen between portrait and landscape views. I’ve always had the issue where I lose connection a lot but was willing to deal with that. For a long time now maybe since I’ve updated the app?? I don’t get any notifications yes I have them on! In the app and in my regular phone settings. I’ve changed nothing and use to get them. This is a big problem as I have been running high without even knowing until I went into it and checked. I’m sitting here at 5 am trying to figure out what the issue is cause I’m not getting notifications. Not on my lock screen or when I’m in a diff app and I have those turned on to do so nothing at all!! That’s just not fricken good!!!! I’m so irritated. It also took me over a month to get more G6 supplies It’s usually one automatic with my mail but didn’t this time and I had to call several times when they said they’d follow up with me, with someone higher up cause it was something in the system. Or they just told me it was confirmed to have shipped. I went without my G6 for right around a month!! My sensors also randomly can’t find connections and then fail and make me replace them when it’s usually a new insertion so I basically am wasting them too! I need this for my health to help me! I’m not feeling like this is helping rn. Please someone help me or change the app. The overall Dexcom system is amazing and has been a huge quality of life upgrade for me. I had originally written a review saying the app needs some significant work, but since then it has been performing better for me. The main thing I would still like to see change is that when I get a notification on my lock screen about a high or low blood sugar, clearing it from the lock screen does not clear it from the app. I will get the alert again a few minutes later. I would just like to make a statement I think all children & adults should have access to these new instruments without all the red tape My grand daughter was so excited when her Dr. told her No more finger sticks Then Insurance says NO But, for $1,700.00 dollars every 3 months You could do that God bless these children It’s not fair If the equipment is out there in this world It should be made accessible to ALL I cry for all who need these things and cannot afford them That’s my statement How can these people rest!! As a diabetic that goes to school the sound is loud and long so it’s embarrassing when it goes off in class I recommend the sound be changed to something less annoying. This is the biggest problem and I believe it needs to be fixed thank you. The app will go off with a high alert. When i click on the app to acknowledge the alert, the app will crash. Then, I reopen the app and since it crashed, will alert to a high again after a few minutes. It’s a continuous cycle that has caused many sleepless nights because it goes off non-stop. PLEASE FIX THIS!!!!! The overall use of the app is great. You are missing to option to lock screen on. Most phones have this feature, but for some reason mine does not. This app also failed to tell me about a low that was happening during the night while my daughter was sleeping. I didn’t receive the alert and she had dropped to 45. I liked Nightscout much better. It also had raw data. Since the newest release came out it has major problems on my 8 plus. For example the alarm goes off to say my glucose is high, I open the app to acknowledge it so it will stop alarming me but the app never opens and just crashes. I have to open it again but it doesn’t “acknowledge” the high warning so I get another warning 20 seconds later, go to open and it crashes. Basically I get stuck in this cycle of high warnings that can never be acknowledged/dismissed. I just have to wait till my glucose goes down but until then it’s constantly going off. I had to turn the phone off the other night just so I could sleep. Not cool, I wish they would have just left it alone. Hopefully there is an urgent update soon. UPDATE: 2 weeks and no update. Same problems. 1 Star now. UPDATE: Noticed when you have a low and using the complication on infograph modular it shows black, not red. You can hardly see it. Software engineers should get their Porsche’s taken away till this stuff is fixed. Please add a Sensor-Expires alert setting. 1) On off switch, and 2) Setting-time-option when the alert shows. Provide for the ability of choosing either alarm-date-and-time OR x-hours-before-expiration. If my sensor expires at seven in the evening, I want to see an alert half an hour before I leave for work that morning. Love the G6 and that it has a smartphone app and love the reports online. Mine ties into the T:Slim pump. My review has nothing to with sensor accuracy, as so far that has been pretty decent. This app has been an enormous disappointment though, even more so, for someone who just got passed over for an iOS software engineer position at Dexcom. I am not mad at all, and I sincerely wish him/her the best, as he/she has their work cut out for them. If you would like some feedback from an iOS Dev with over 5+ years experience, who also happens to be a Type 1 Diabetic for 20+ years and counting, who has survived over 12+ seizures, here is my take, after about two weeks with it. Its extremely unreliable, unless frequently opened, which indicates a need for significant improvements in background updates, and the Watch OS complication, frequently displays nothing meaning either your app got killed in the background for some reason, which needs to be evaluated ASAP, or you sent too many complication updates from the iPhone to watchOS and ran out of updates for the current time period, which indicates a need to reevaluate this section of the app as well. The colors are hideous, and now to my absolutely least favorite part. When my sugar is dropping, I am greeted with an enormous barrage of notifications that are sent way too frequently, despite my best attempts to tune them in the app’s settings. This does not help me at all, in fact quite the opposite, as it actually triggers significantly increased anxiety from the non-stop notifications, as if I had forgotten, when each time they scare the crap out of me. Yes, I can of course disable notifications all together, but this completely defeats the purpose of having this for me. So ya, I hope your new iOS Dev found at least this much wrong with the app in their interviews. If so, you hired a good one. Best wishes, as I really do believe this product could be amazing, but it is still very far from it. Whoever is running this now, please step up soon. As I typed this message, I literally received 6 notifications from The Dexcom app. Please re-evaluate this. I was a HUGE fan of the app that accompanied the G5. While I do love the new G6 your app is a GIANT disappointment following the previous version. It constantly crashes on me, it shows a blank screen when I try to open the app from a notification, and notification alarms don’t clear properly. The events page takes forever to load also, adding events takes even longer. I miss the ability to add more than one event simultaneously. And why in the world would you get rid of insulin dosages to the hundredth decimal place?! It makes keeping track of insulin pump dosing inaccurate. I keep hoping for an update that fixes these issues but 4 months later still no fix. Sorely disappointing app coming from a company that is so on top of their game in their other products. The G6 is great, but for whatever reason the app has terrible connectivity, meaning the share feature is kind of useless for the most part. I will get an hour or two to actually show up in my log over 24 hours. The receiver does not have these same connection issues and I’m assuming this has to do with the dedicated connection. I would love there to be an alternative to connect the receiver to my phone to at least automatically backlog Clarity. Over all, tons of potential, but the communication feature has rendered the app mostly useless and I only use the receiver. I can’t say that I’m very satisfied with the app. The G6 itself is great. But sine downloading the app I have received so many signal lost notifications!! At least one or twice an hour the app loses signal. The app was one of the highlights for getting the CGM and the app has prove, thus far, to be not very useful! With a lost signal all the time it does no good. Will update review if improvements are made. Last night I get an alert stating that app stop working and to delete and re download which I did but now the app won’t open I can’t delete it this is a real inconvenience. Fails at a random point after you have been using the new one for weeks; Then it asks for the calibration ID which isn’t available since it was on a piece of paper I threw away 5 days ago when I changed put my sensor for the fourth time since swapping transmitters. First off why isn’t there an option to change the transmitter ID without having to code a sensor, my pump integrated a sensor attached to my phone without issue. Second off why the coding, a technology solved a decade ago with test strips; I guess those will be your G7 and G8 features. If I had a dollar for every time this app crashed, I could buy a sensor without insurance. Fix this. I think it’s unbelievably inconvenient to receive a notification about a low blood sugar, I go to open this app and acknowledge that I see my blood sugar is low, and then the app crashes. So I try to open the app again. I know if I don’t click “OK” within five minutes my phone will start beeping at me. I’m a college student, and when I’m not in class I’m at work. Do I want my phone to be ringing with alarms in class or at work? No, that’s why I keep it silenced 24/7. If this app continuously crashes while I try to respond to the notification, I cannot prevent this alarm while simultaneously distracting myself from my other work. Fix this app from crashing. One of my biggest issues with diabetes is how much time it takes for me to manage it on top of my other daily activities, so I thought a CGM would save time from checking my blood sugar with a meter. As it turns out, since I’ve upgraded from the G5 to the G6 sensor and downloaded this new app, I have been spending MORE time using this app simply trying to see my blood sugars than I was before when I had to manually calibrate the app twice a day with a finger stick reading. I have a widespread connection to the diabetic community, both on and off campus, and I cannot express my disappointment in this app enough. Until it’s fixed I won’t be happy with it. I downloaded this app .It keeps loosing signal . My sons Doctor push for to get this app on my cell to give me piece of mind . I’m not happy at all with this app , I’m probably going back to the Dexcom device. Latest update broke things that weren’t broken and didn’t fix anything that was broken. App now has audible alerts for high blood sugar even though it is set to vibrate only. Crashes frequently and freezes upon opening from high alert notification. High alert notification set to every 45 minutes, alerts every 5,10,15 minutes even when dismissed. Incredibly frustrating to encounter these issues for years from a life-saving medical device you rely on. The only alert you’ll ever get is that the Bluetooth connection was lost. You have to keep the app open so you don’t get signal loss which will drain your battery. But otherwise I am glad I made the switch to the G6. Making life easier and getting my A1C lower.